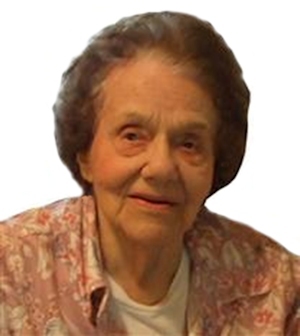 Obituary – Carter, Audrey Blanche (Merriman) « Perry High School Alumni Association, Inc.
– daughter of Mr. and Mrs. Joe Merriman, was born June 3, 1918 in Billings, Oklahoma. She has attended Happy Hill School, District 57, North Valley, and Perry High School. While a student in Perry she has been a member of the Girl Reserve and has appeared in the school operettas. She received certificates for four years perfect attendance. Miss Merriman is especially interested in the business world and Beauty Culture work. She is undecided as to what she will do in the future. Audrey Carter, 91, passed into the arms of Jesus, January 2, 2010 in Oklahoma City, OK.
Born on the family farm northwest of Perry, OK on June 3, 1918, she was the oldest of the four children born to Joe and Gretta Merriman. 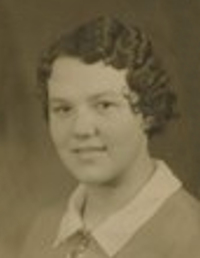 She graduated from Perry High School in 1936. In 1938 the family left the farm and eventually ended up in OKC. She worked at the Oklahoma City Air Service Command, now known as Tinker AFB, as a Junior Aircraft Engine Inspector during WWII. In July 1946, she met John Carter on a blind date and was married after a two-week courtship. They moved to The Village in April 1952, where they raised two children. Audrey was an accomplished seamstress, homemaker and a caregiver most of her life. Widowed in April, 1968, she continued sewing, but also worked for the Will Rogers Theater and for an interior decorator, making window treatments while continuing to raise a 14-year-old son. She cared not only for her own mother for the last ten years of her life, but has cared for lives of everyone she came in contact with, always offering a kind word and a smile. Audrey served 29 1/2 years before retiring from the nursery at Britton Christian Church, where she had been a member since the 1960’s. She loved little children and babies. They would always bring a smile to her face. During the last year, she resided at St. Anns Nursing Home in OKC. She is preceded in death by her parents, Joe & Gretta Merriman; and husband, John Carter. She is survived by her daughter, Beverly and husband Dave of OKC; son, Dennis and wife Sherry, Katy, TX; granddaughters: Stephanie Morningstar and Cheri’ Redburn of OKC; grandsons: Chris Carter and wife Kim, Austin, TX; Kevin Redburn and wife Lindsey, Allen, TX; Rev. Derek Carter and wife Laurie, Ft. Worth, TX; great-grandson, Hogan Redburn; brothers: Ed Merriman, Grenada, MS; Bob Merriman, OKC; and sister, Burnie Sanderson, Edmond, OK; and many nieces, nephews, cousins and countless friends. A woman of great faith, undying optimism and flawless integrity, she left this world and all who came in contact with her better than before. Services will be 10 a.m., Tuesday, January 5th, at Britton Christian Church, 922 N.W. 91st Street, Oklahoma City, Oklahoma 73114. Interment at Sunnylane Cemetery, Del City, OK. In lieu of flowers, the family asks you to consider a donation to the Children’s Ministry at Britton Christian Church in memory of Audrey.